My Christmas Chocolate Chip Cookies Are Beyond Easy (Perfect For The Kiddos To Help With). 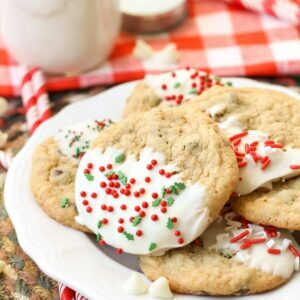 If You Love Chocolate Chip Cookies And You Love Christmas, Then You Have To Try This Recipe. Make cookies as directed on pouch. Let cool completely. Pour your vanilla candy coating (or white chocolate chips) into a small pot. Heat on LOW temp by stirring with a rubber spatula constantly until all melted and smooth. Dip cookies halfway into melted white chocolate mixture and place on parchment paper. Sprinkle with holiday sprinkles. Let sit for 1-2 hours until firm.